It's nearly that time of year again when Victor Harbor Rotary Club will play host to hundreds of artists and some 1200 paintings in its annual art show. The show attracts artists from around the country with its alluring prize money and amazing percentage of sales. This big event in the Australian art calendar has artists presenting their best works - some that have been saved all year just for this particular show. The amazing thing about having those 1200 or so works in one giant marquee, is that everyone of them has a unique story. I'm not talking about the story that the painting portrays but the story 'of' the painting itself. It's largely a hidden story and parts of it is a mystery to both the artist and the buyer. The buyer has little knowledge of the conception, birth and early life of a painting. The artist of course knows all about it! The artist first knew what they wanted to paint and they visualised how it could look as a finished piece of art. They even thought how they could improve on it to make it more appealing by giving it a focus that may not have been there in the reference. Then there was the size to consider, the colours and maybe the frame. This is where the story begins and there's more. The finished painting on the wall doesn't tell us about the possible dramas in production - the times we couldn't do anything right, the times we just gave up or wanted to give up. It may have even been discarded completely, but then revived some time later when it all came together! Then there's the hauling - artists always seem to be hauling paintings to shows and in an out of cars, all the time concerned about the damage that may happen along the way. Then we worry about how it's going to look at the show with all those other great artists there. It's a story that may be repeated often before the painting sells, if of course, it ever does sell. I know most artists love the excitement of the opening day and we get to see our work and those of other artists that we have long admired. All the dramas that may have happened in production are soon forgotten as we see our babies on display. The life of a painting is now mostly out of the control of the artist. A buyer loves a piece of art and they purchase it, often a person unknown to the artist and because of privacy issues they may never know who now owns it. It is here that art begins a new life. It is a mystery to most artists what happens to it next, but paintings live on in the lives of a family through good and bad times. It becomes a part of the fabric of a family in which it may be loved for generations. The latter part of a painting's life may be a mystery to the artist, but what a privilege it is to have created something that has such an enduring story in front of it. Artworx Gallery has five rooms full of paintings waiting right now for their stories to continue - come and have a look! 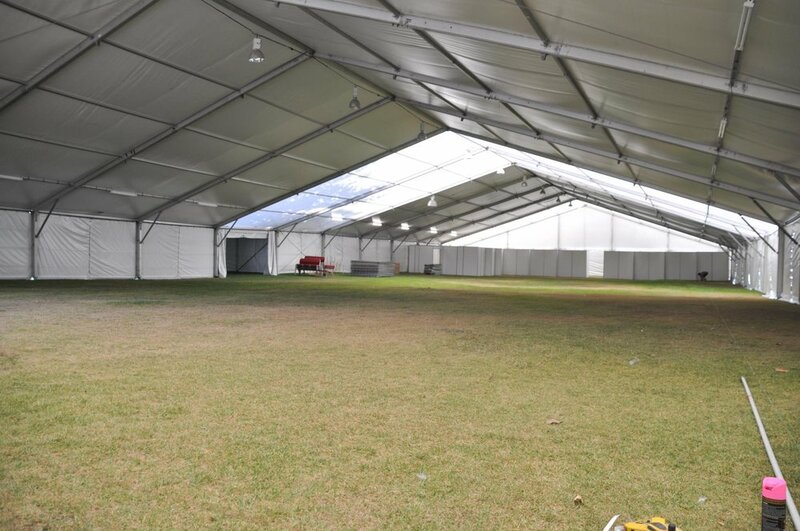 The big marquee is ready for the display boards and the paintings with a thousand stories to tell!